Having decided to take the bold step of becoming an employee-owned company, written up a prospectus, determined a valuation, and heard “yes” from seven interested employees, I now had to figure out how to execute the transactions. A big part of that was financing. In the first offering of the Atomic Plan in May of 2009, the average age of the seven buyers was 32. Many of them were probably still paying off student loans. None of them had yet had the opportunity to build significant wealth. Few if any had equity in a house (or any house at all). They were all going to need financing to make this happen. We’ve refined our approach to financing Atomic Plan loans over the years. In this post, I’ll describe what’s driven those changes and what’s worked out for us on the financing front. 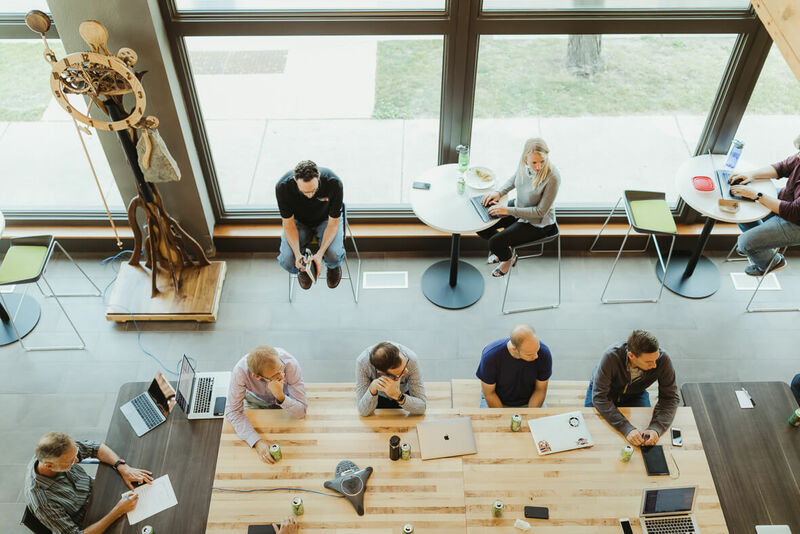 This post is the fourth in a series on Atomic Object’s ownership and the non-ESOP approach we took to gradually shift from a founder-owned to a broadly employee-owned company. While selling 14% of the company for $350,000 seems like a screaming good deal 10 years on, that was a lot of money to finance back in 2009, in transactions ranging from $30,000 to $70,000. Those were also very large loans and down payments for the people buying into the company. This dynamic of employees being quite young when offered the opportunity to buy shares hasn’t changed in 10 years. If anything, it’s gotten more dramatic, as we’ve established a regular pattern of offers happening in the year an Atom reaches five years of tenure. If you start with the company right out of college, you’re still comfortably in your 20s at the time of that first offer. While our bank wasn’t willing to extend loans collateralized by shares in the company, they were supportive of our plan. My co-founder and I were willing to use the proceeds of the sale to collateralize the loans. For this first offering, the bank made loans to the seven participants directly to purchase shares, and the proceeds of those sales were put right back into the bank as collateral for the loans. Over the years, as the loans were amortized, my co-founder and I got those sale proceeds released to us. The bank did formal documents, collected payments, sent reminders, imposed late fees, tracked amortization, and generated reports as needed. This arrangement worked well: the co-founders didn’t need the funds immediately and were confident about the future of the company. The bank didn’t take unacceptable credit risk and serviced the loans. The cost of that servicing was 20% of the interest on the loans; the co-founders received the remaining 80% of the interest charged borrowers. We asked for a 10% downpayment in the first round, not fully appreciating that the co-founders would be liable for capital gains tax on the entire $350,000 of sale in the year the transaction took place. The downpayment likely didn’t cover my capital gains tax bill that year. We set the interest rate at 5%. That rate was less than anyone could get an unsecured loan for, and likely less than other loans held by the borrowers. Using a favorable rate meant people weren’t anxious to pay off these loans if they had extra funds. Some borrowers reported to me feelings of conflict about whether it was right to pay off other loans or make other investments if they still owed on their Atomic Plan loan. Setting the duration of the loan was tricky. I wanted to amortize the loans reasonably quickly, but I didn’t want key employees stuck with a monthly payment they couldn’t afford. The bank suggested a structure of 7 years amortization with a balloon at 3 years. I think they did this to protect the co-founders in the event of a dramatic rise in interest. Neither Bill nor I really cared about this, but we went along. Later, I heard some FUDA around the balloon feature. As things went, we hit the 3 years, and I refinanced the loans at the same terms. In hindsight, I wished that I’d nixed the balloon feature in the first place. Since by 2009 we had predictable results and a generous rainy day fund, we’d been doing distributions of profits on shares each quarter. It was clear that new owners would be using those distributions to help them make their monthly loan payment. If we’d set the full amortization duration shorter, thus increasing the monthly payments, the distribution may not have been enough help. If we’d set it too long, my co-founder and I would have been stuck holding these generous (to the borrowers) loans past the time they could have been paid off with distributions. Dialing that in was tricky, since it required predicting our future profitability, predicting future investments we might make, considering individual tax and economic situations, etc. The riskiest part of the traditional fixed term loans we made in this first round was that it fixed the monthly payment. We put our senior makers and strategic employees in a potential conflict: to pay their loan easily, they wanted short-term profitability; as shareholders they should also want the company to be making investments with an eye toward the long-term. I heard some comments about this conflict and felt some pressure on our investment strategy. We resolved this tension when we took the loan processing in-house. The main motivation for using the bank to administer loans in the first offering was to act as an isolation layer between the co-founders and the borrowers. I didn’t want to be chasing late payments, considering hardships, imposing penalties, etc, while I was actively managing these same people. Things went so smoothly that by the next offering in September of 2012, we decided it was okay to bring the financing in-house. This saved the lenders (only me by that time) the interest held by the bank for their services. It also created work internally that was born by the whole company, something which seemed fair given the goal of employee ownership. The loans I’ve personally extended for the Atomic Plan since that time have been simple interest with no balloon and a dynamic period. The novel feature we introduced on the duration or period of the loans was to address the conflict discussed above. Instead of a fixed duration which determined a monthly payment, we moved to a small fixed monthly payment with a mandatory additional quarterly capital payment tied to distributions. The small fixed monthly payment was intended to first of all work for the borrowing Atom’s family economy regardless of our profitability level. Secondarily, it was supposed to cover the interest on the loan. In addition to the regular monthly payment, each borrower was required to make an additional capital payment on the loan of 70% of the amount of the distribution paid out on the shares associated with the loan. The intent was that if we were very profitable the loan would be amortized more quickly, and if our profitability (and hence distributions) were lower due to either performance or investments, they’d amortize more slowly. The loan would “breathe in and out” naturally, never putting the employee borrower in a bind. 70% was intended to leave 30% for the Atom to pay taxes on the distributions with. The only changes we’ve made since 2012 were to move to a 50% quarterly additional payment, to ask for a 20% downpayment (not always enforced), and very recently to use a floating rate tied to prime with annual adjustments. The move to 50% came about because I found myself feeling resentful of the way some Atoms who used the financing of the Atomic Plan characterized the opportunity to buy into the company. From my perspective, I was selling my personal shares at a favorable valuation. I was also financing their loans at a low interest rate, carrying the credit risk, and allowing for a variable period of payback. It seemed pretty generous to me. From their perspective, until their loan was paid off, they weren’t benefitting from owning the shares. No new kitchens, windows, nice vacations, or college saving contributions. I sometimes heard comments that made it seems like this generous thing I was doing was, in fact, a burden on those buying in. Not a good place for any of us to be. Since we moved to the smaller mandatory additional capital payment of 50%, each Atom can decide whether they want to pay off their loan more quickly, or slow it down a little, pay more interest in the long-term, and have the immediate enjoyment of more money in their checking account. I haven’t heard any complaints or negative comments since this change. Whether that’s because of the change or because people learned I didn’t appreciate the perceived ingratitude, I’ll probably never know. When we took the loan processing in-house, we insisted that all payments were done electronically into an investment account owned by me. Statements from this account were then used to reconcile loan accounts. The entire system runs off interconnected Google sheets, with each individual having read-only access to their personal sheet as a record of their loan and payments, and a central sheet which aggregates all loans and allows for easy reporting to me about outstanding balance, interest paid, etc. Handling multiple loans per person, tracking installment loans, and allowing for interest rate adjustments have required additional complexity. This system was created and has been extended and improved over time by Mike Marsiglia. He also authored the custom tool we use to keep track of our cap table and share purchase and sale history. Mike has also taken on the responsibility of reminding people when loan payments are missing, late, of the wrong amount, or sent to the wrong place. My sense is that this has been a manageable burden and required a relatively small amount of time overall. Carl – once again, this is a terrific piece of writing. The insight is really valuable. I feel like I’m getting a Masters in Small Business leadership – thank you for taking the time to write these. Thanks for the nice words, Gordon. This one in particular got into the weeds, but it feels like a valuable field to explore and hopefully helps some other folks interested in the subject.